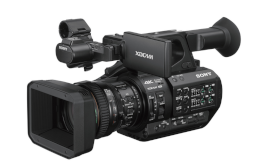 World's first 1/2-type 3CMOS Sensor for broadcast 4K The Z280’s all-new Exmor R™ imager is custom-designed for broadcast 4K acquisition. Its three 1/2-type Exmor R™ CMOS deliver a deep depth of field with superb image quality. Red, blue, and green light are independently captured by separate image sensors, contributing to high resolution, high sensitivity of F12 (59.94p) and wide dynamic range. An advanced LSI (featuring intelligent noise reduction, enhanced detail reproduction and distortion correction technologies) delivers remarkably lifelike 4K 4:2:2 10-bit images. Even if you’re delivering in HD, your recordings will capture detail and image texture that HD sensors simply cannot see.